The signed combs of Auguste Bonaz are widely sought by collectors and the works of his studio are acknowledged as being among the best of the Art Deco period. The company remained in business until 1982, with a portfolio of designs which spanned the decades from the late 19th century. Maison Bonaz worked in new products such as Bakelite and Galalith, and explored the versatility of these materials and their specific qualities. Their designs were well in advance of their time, reflecting the love of change, originality and innovation which were among the major components of Art Deco. Craftsmanship was always combined with high design aesthetic, and the hair accessories and vanity items produced by the Bonaz atelier are always of the best quality and finish. In this section you will find examples of the Bonaz workshop which reflect changes in design throughout the early to mid 20th century. Contemporary with Bonaz were many other quality workshops who also signed their wares, such as A & H Chevalier and Camille Guillot. We have added examples of their work to this category, together with some un-named designers who were clearly working “in the style” of Bonaz and were influenced by him. 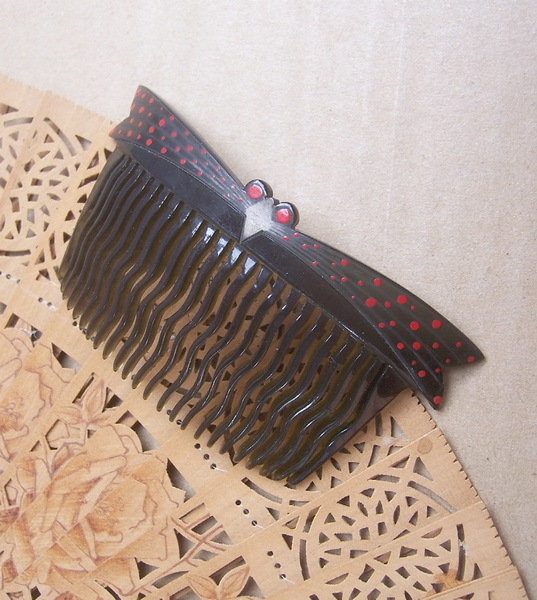 This handsome black celluloid comb dates from the first few years of the 20th century and shows some Art Nouveau influence in the use of the asymmetric design which has an organic feel. It has been given additional interest by the use of faceted pieces of French jet in the form of ellipses, with a circular dome in the centre. The observance of mourning remained an important social custom in the opening years of the 20th century and was only discontinued with the mass slaughter of World War I. This comb may therefore have been used for mourning. The lady in the final picture, which shows a late Victorian couple, has similar asymmetric styling. 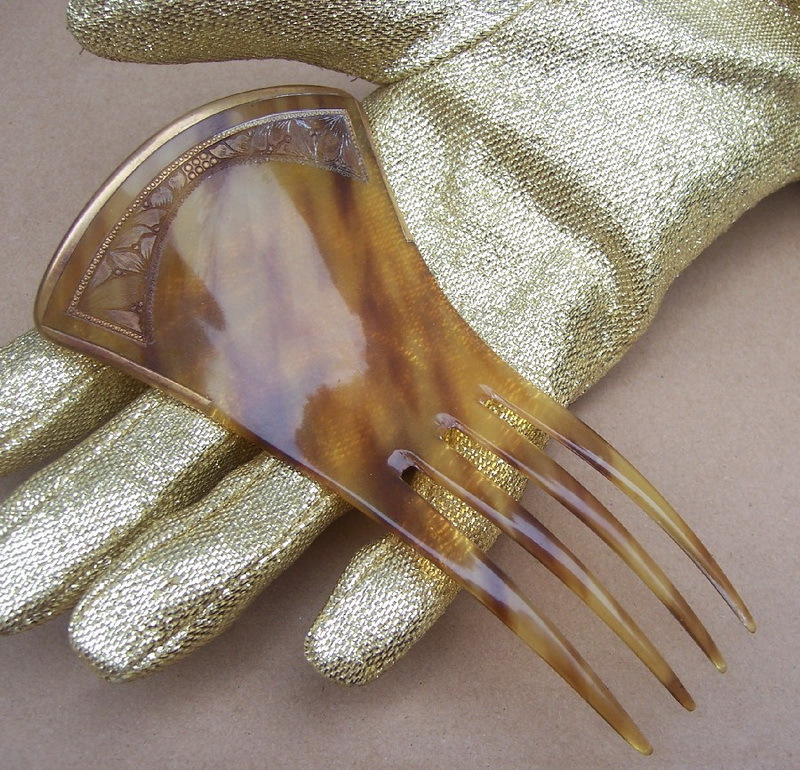 This is a pretty amber coloured comb from the Bonaz workshop and probably dates from the early period of production. 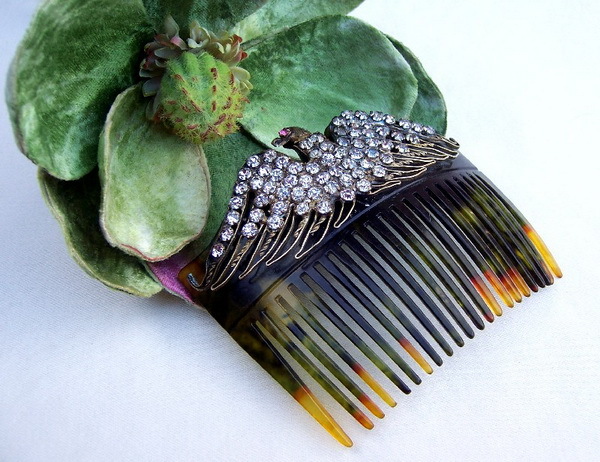 Such combs tend to have more elaborate detailing and decoration than the sleeker examples of the mid 1920s onward. The wedge shaped heading is in the mantilla style with a border of fancy work deeply engraved into the material. Gilding has been applied so that it remains in the lines of the design which depict freeform fruits and leaves treated in a naturalistic manner. There is some wear to the gilding. The final picture is from a photograph of the late 19th century where the sitter wears a comb of similar outline standing proud of the crown. 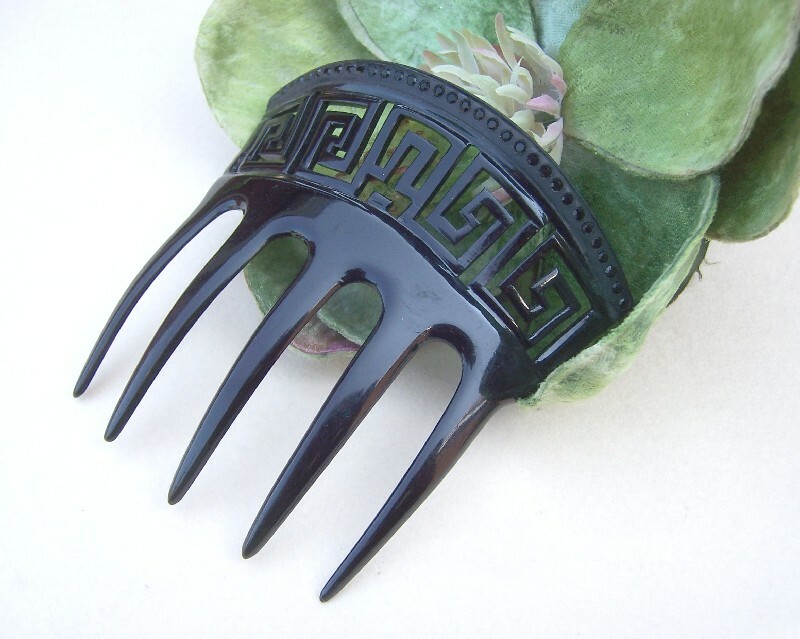 Here we have a black celluloid back comb equipped with a simple and sculptural design which is generally known as the Greek Key. The Greek Key is an ancient pattern, found in classical Greek and Roman architecture and also used in Mediterranean vases and in mosaics. It is a type of running ornament, often contained within a border, consisting of a fret design with many involved turnings. Some historians feel that the Greek key has its basis in the Greek myth of the labyrinth that imprisoned the Minotaur. Another suggestion is that it is a stylised representation of waves (square ones!). Whatever its origin, the Greek key is one of the most attractive and typical designs which appear upon these historical type hair ornaments. The final picture shows a contemporary magazine advertisement for the French House of Auguste Bonaz featuring a black hair comb of very similar design. 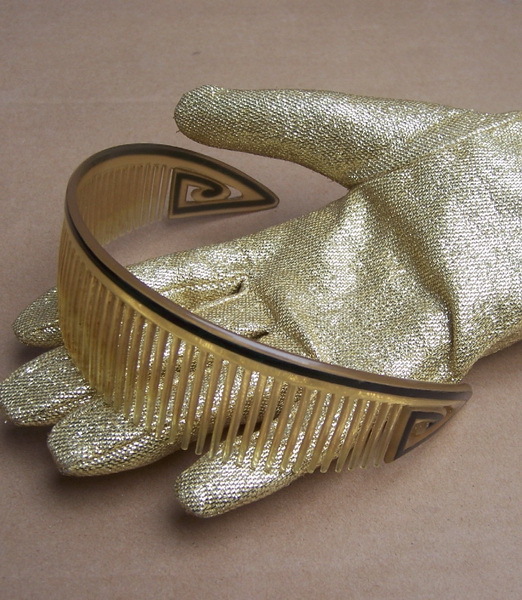 The comb is presented as an object of desire. This style of comb is often called a bandeau comb because of its wide shallow heading, which encircled the back of the head. These combs were greatly favoured in an era when women cut their hair short, but may wish to add a postiche or false piece to provide a more glamorous appearance for evening or formal occasions. The fine example by the Parisian house of Auguste Bonaz is made in attractive two tones celluloid, with a little cut out detail at the extremities. The comb is signed on the back. The various fashion illustrations show how useful combs like these were. They could be used with a short cropped style to keep the ends on the nape neat and tidy. They could also be worn with longer curled styles, or placed above a faux chignon to conceal where it had been added. 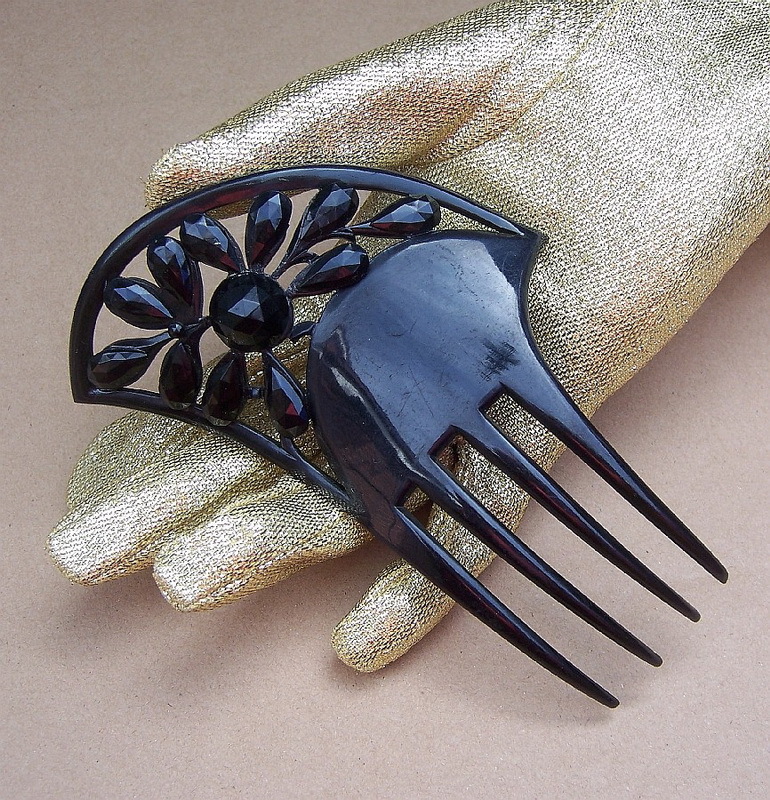 This is an unusual little comb from the famous fashion workshop of Auguste Bonaz. It is made in black celluloid and had a heading design which is suggestive of a winged insect which is spread across the top of the comb mount. Or it may suggest the beak of a bird! Your guess is as good as mine. The heading has a number of circular apertures which appear to form “eyes” on either side of the beak and spots on the “wings”. These are in filled with transparent dark red resin providing a stained glass effect. The comb has the usual Bonaz signature in cursive script on the back of the heading.